Cold in the earth, and the deep snow piled above thee! F rom these brown hills have melted into Spring. Hopes with obscure but cannot do thee wrong. Down to the tomb already more than mine! How could I see the empty world again? One size fits most, felt to size. Flowers vary. Unfelted: 12sts x 16 rows = 4"
PM, join round, knit around placing one marker every 15 sts. Break yarn, draw through remaining 8 loops twice, pull tight and secure ends. Full. When desired size has been achieved, remove hat and block over rolled up towels. Cast on 40 (48, 56) sts. Repeat until only 1 st. remains. If you have 3 sts at the end of a row, k3tog. Break yarn and draw through last st. Stitch in place. 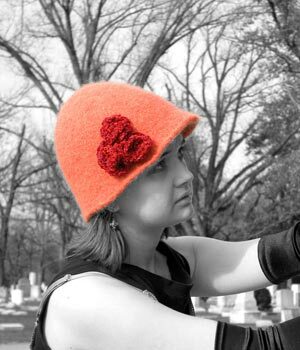 Thread flowers onto a safety pin and attach to felted hat.